One thing is undeniable. 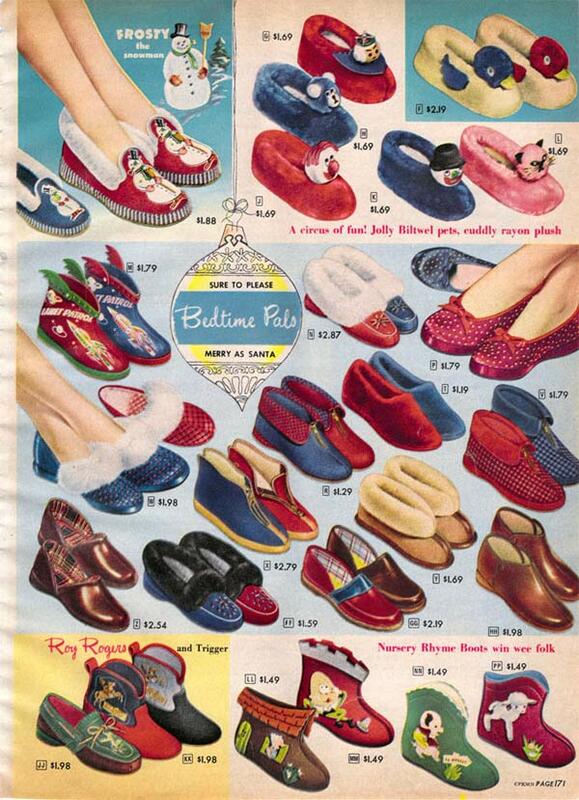 In the 1950s, footwear was an incredibly important part of the wardrobe. 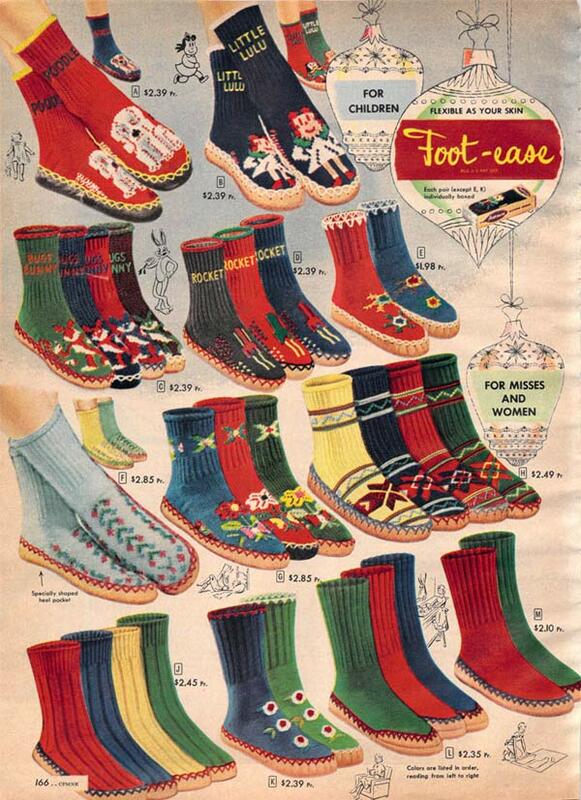 Both men and women had a wide variety of socks, slippers and stockings to choose from. Certainly houses were much draftier in the 1950s. The old Victorian style houses had leaky windows and, if you had a furnace, it was not anywhere close to the quality of today’s furnaces. 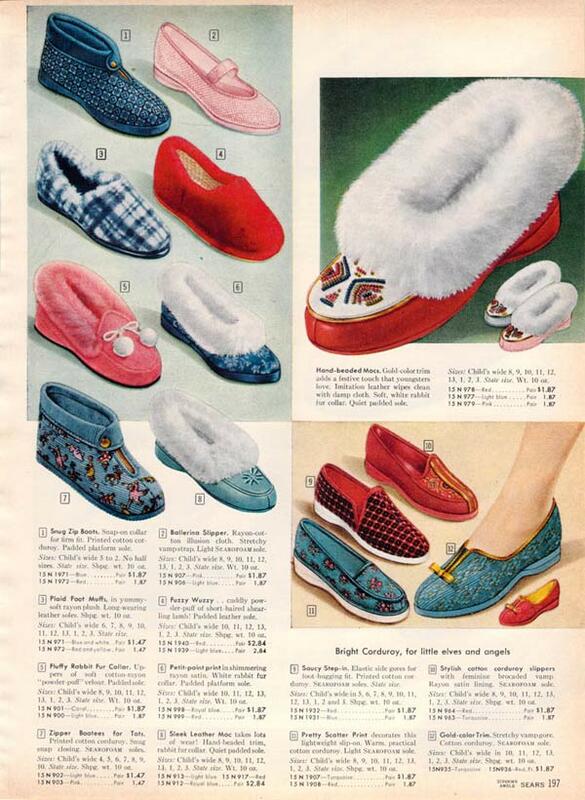 Every member of the family needed slippers to wear around the house. 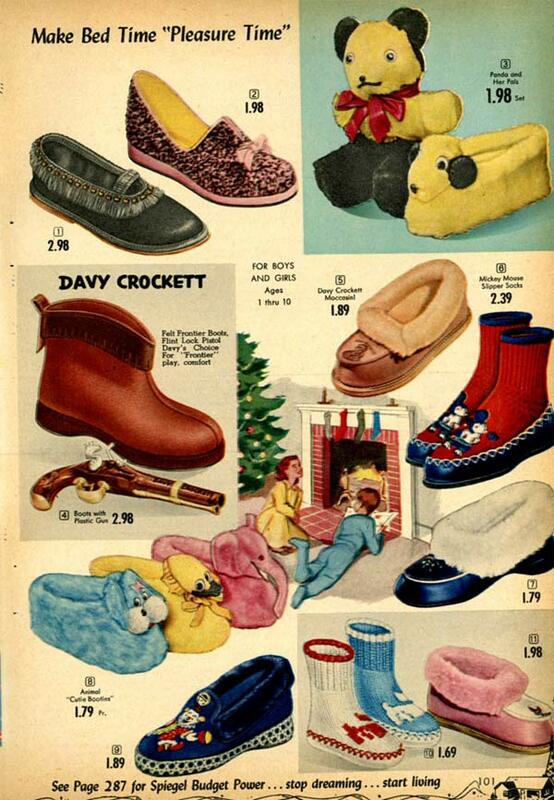 But never fear, department stores carried all types of slippers for men, women and children. 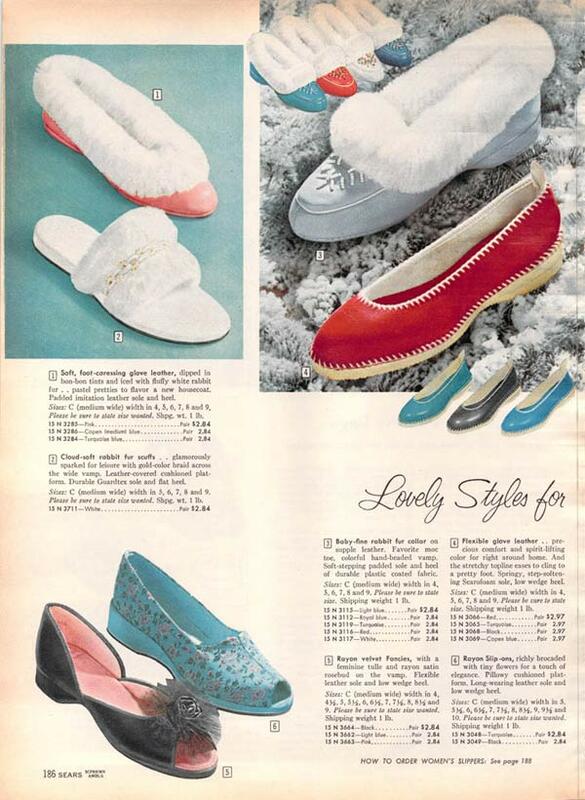 Moccasins were extremely popular, as were slippers with wool lining on the inside and around the ankle. 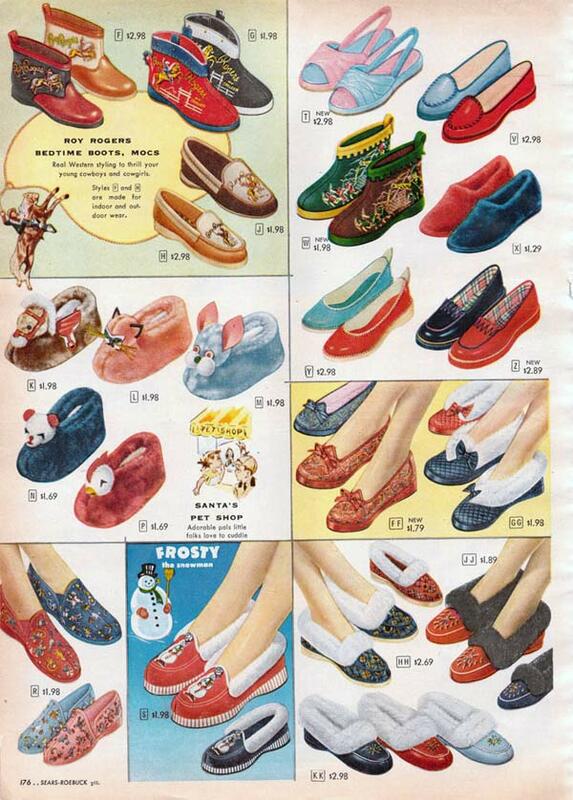 Many slippers had soles that were similar to shoes. 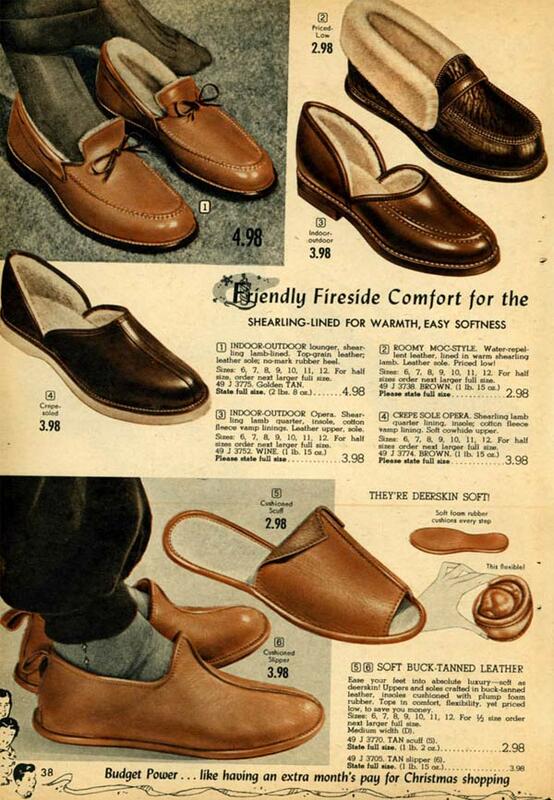 This is because sometimes you had to go out to the porch to bring in firewood. 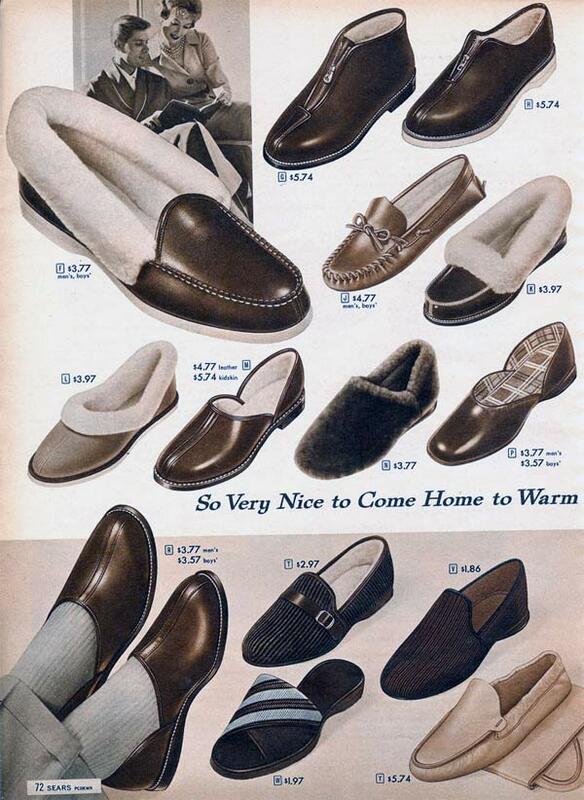 These slippers also were typically made out of leather. 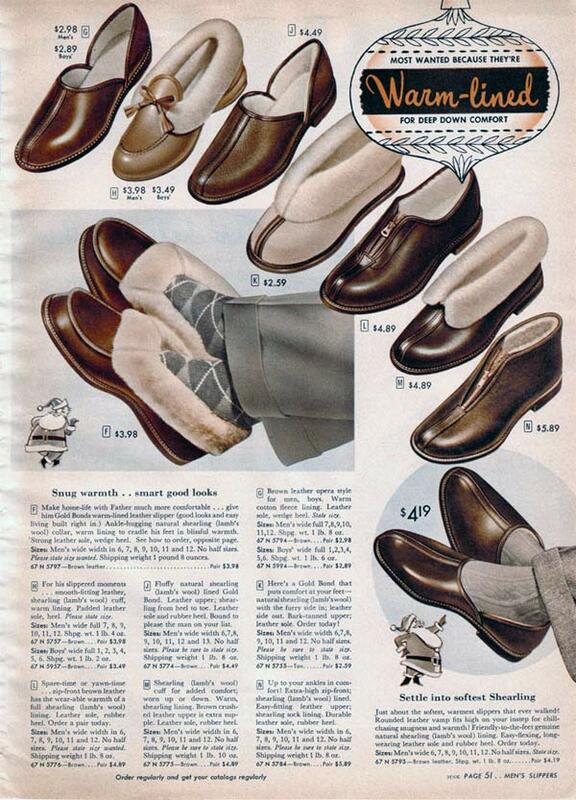 Women’s slippers were less rugged and certainly more comfortable. 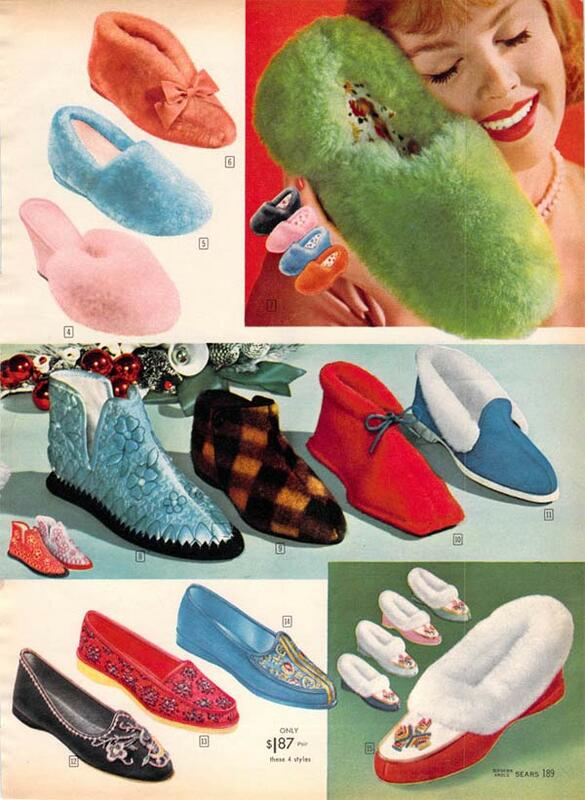 Interestingly, in the 1950s, slippers started to be worn outside the house. 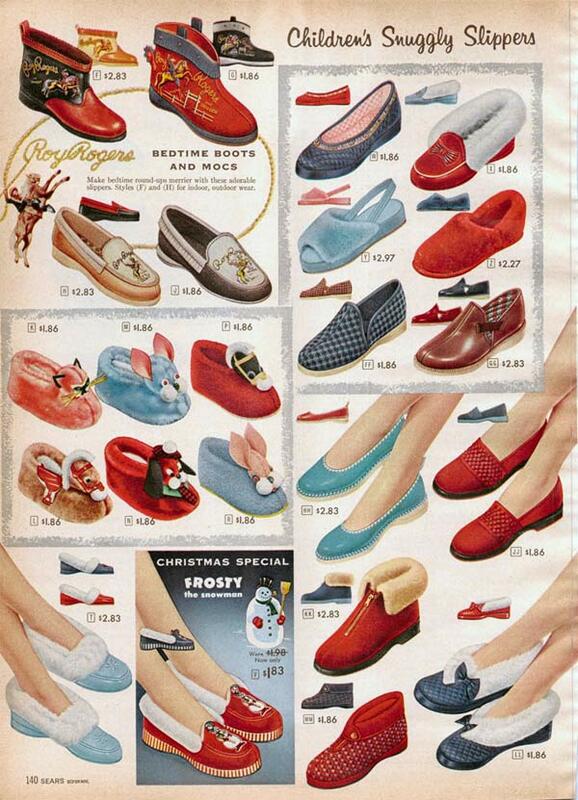 Toward the late 1950s, women were wearing ballerina slippers (with bows) everywhere. 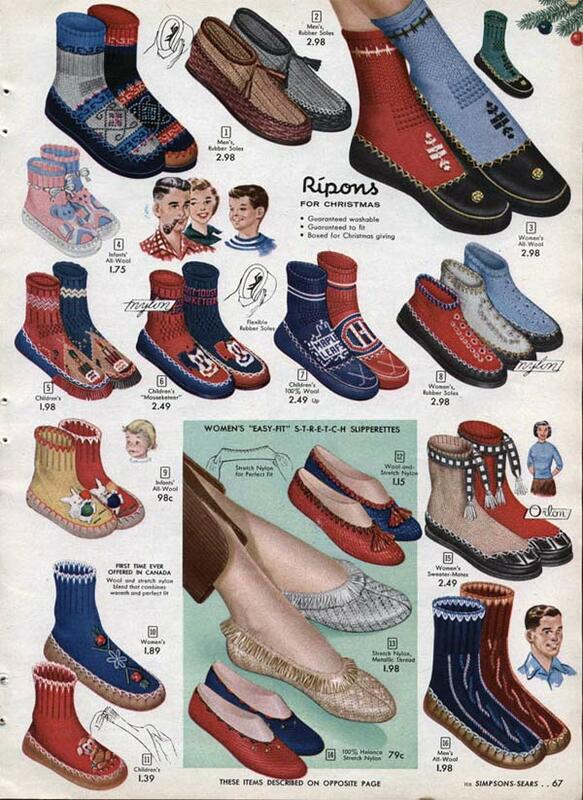 Children’s slippers were often made in the shape and design of popular cartoon characters or animals. 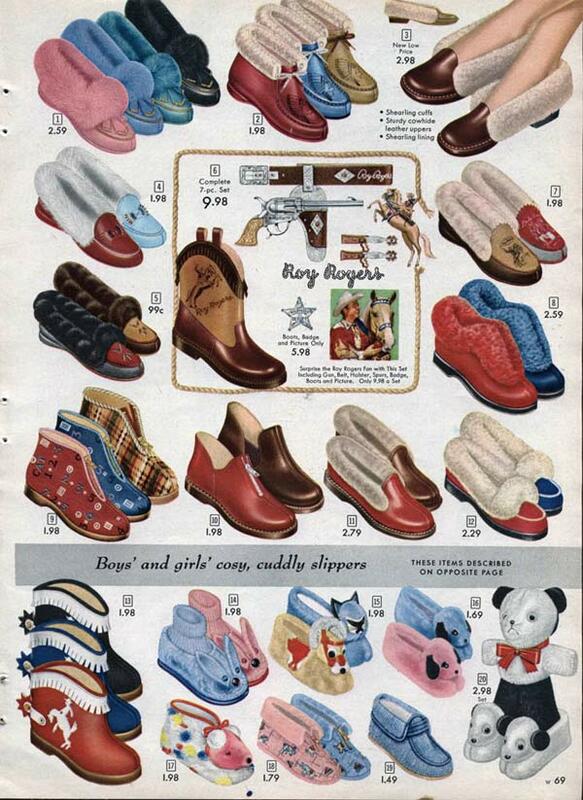 Some boys had slippers shaped like cowboy boots. 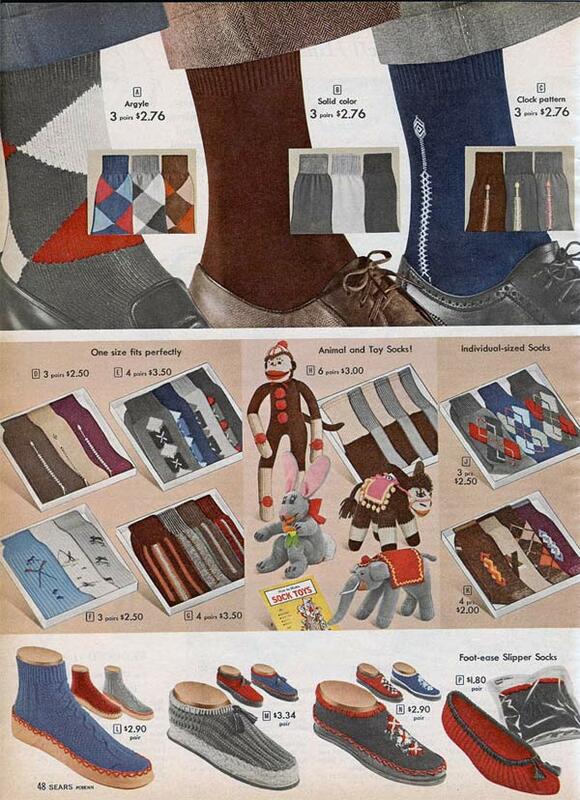 Men’s dress socks weren’t much different than they are today. 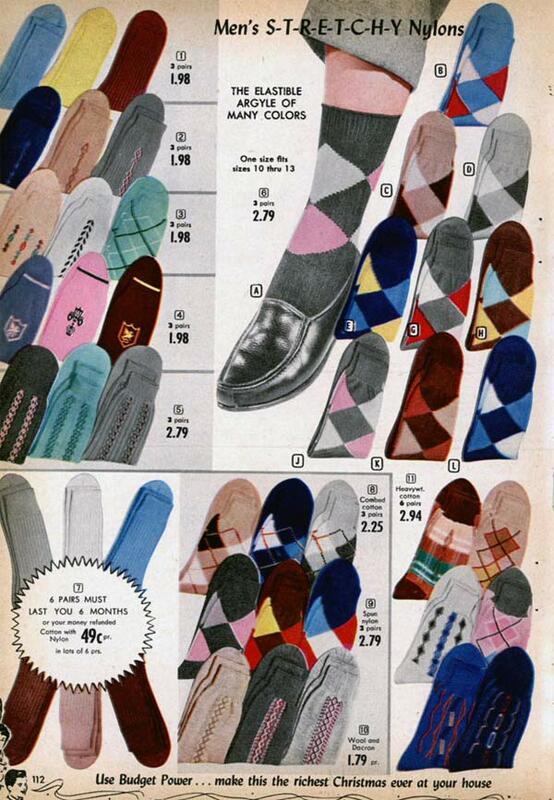 They came in all colors and patters, with argyle being an especially trendy choice. 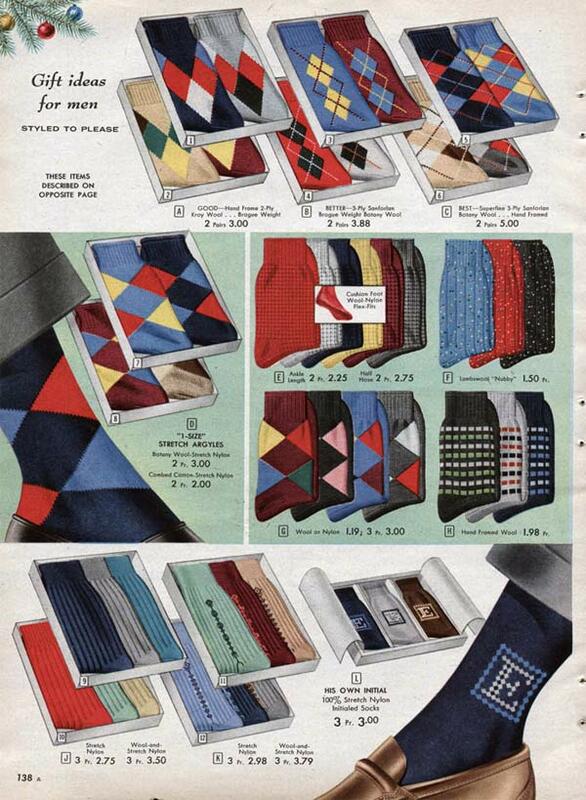 Literally any color combination was fair game: from pink and brown to blue and purple. 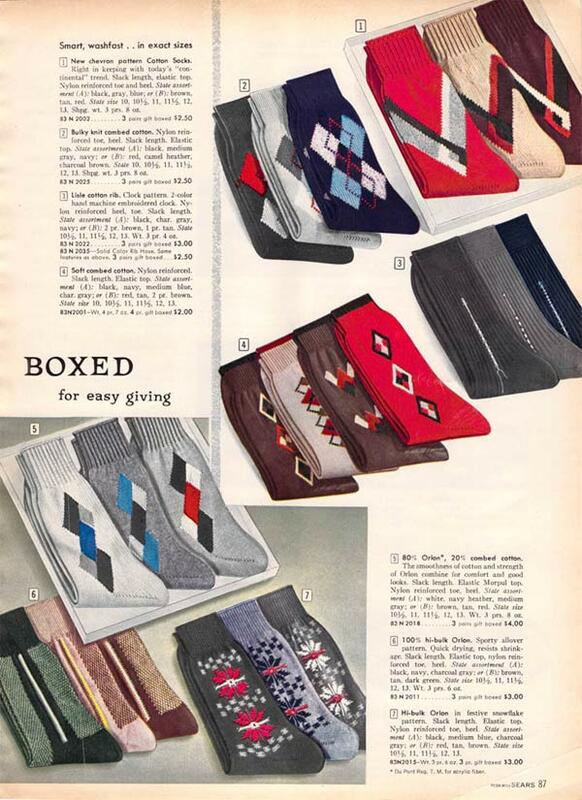 1950s socks typically came midway up the calf. 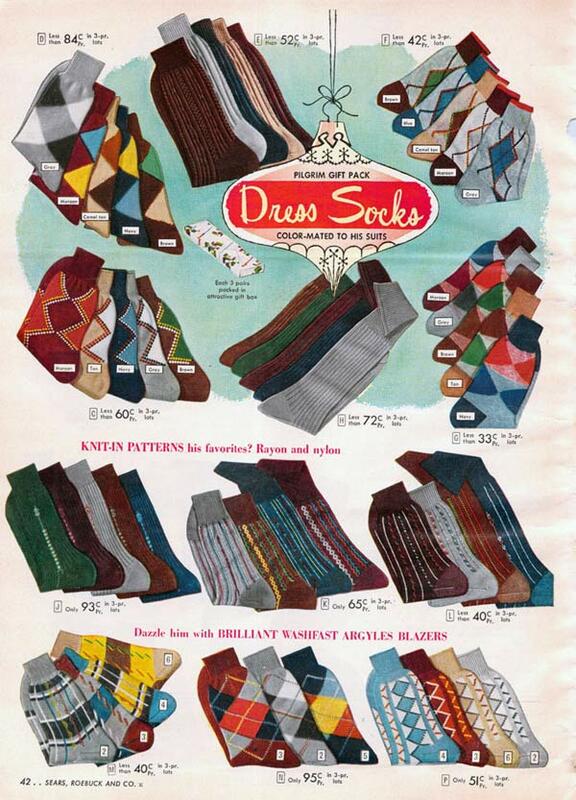 Men also liked ribbed socks and socks that matched their ties. 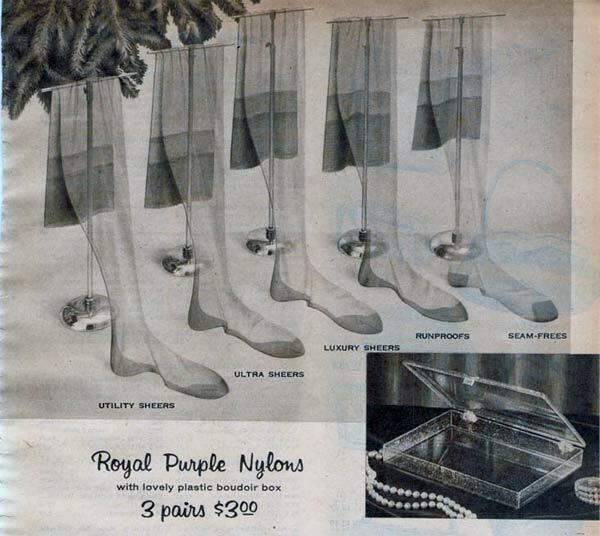 Outside the house, women most often wore nylons. 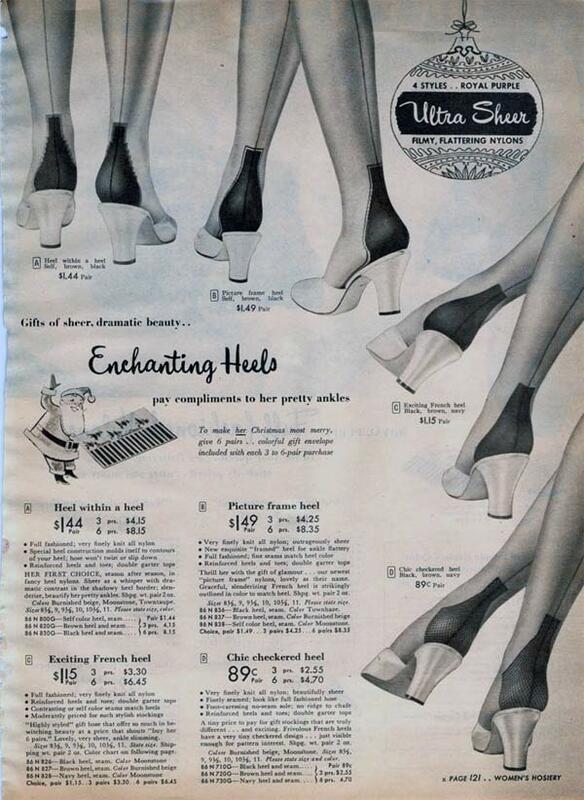 Some of them had extra fortification near the heel. 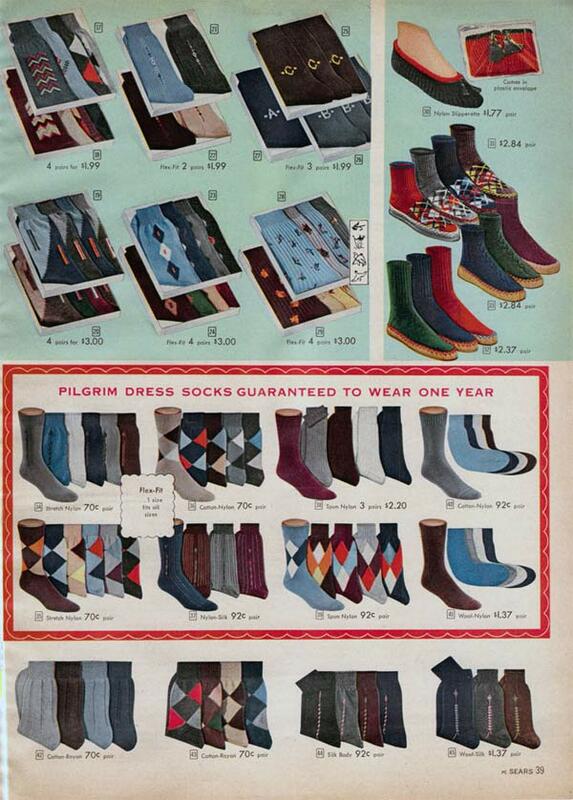 However that doesn’t mean women weren’t wearing socks. 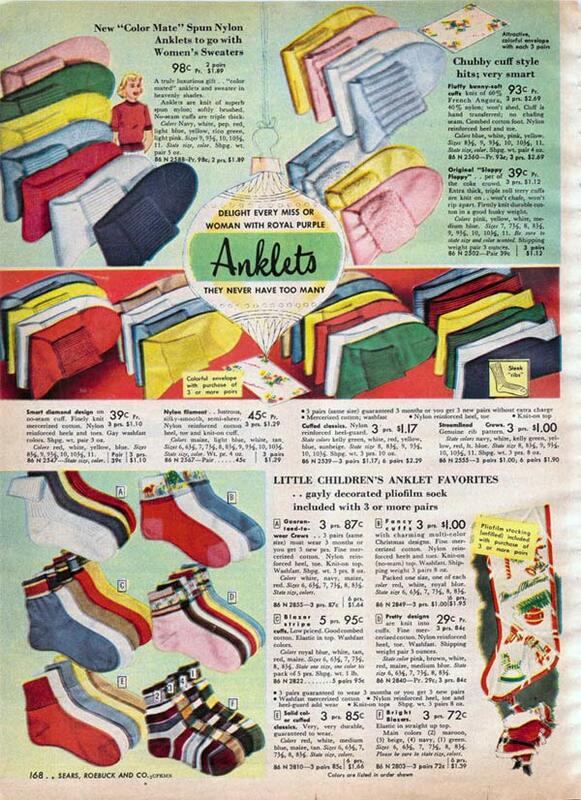 Teenagers especially loved bobby socks and anklets. 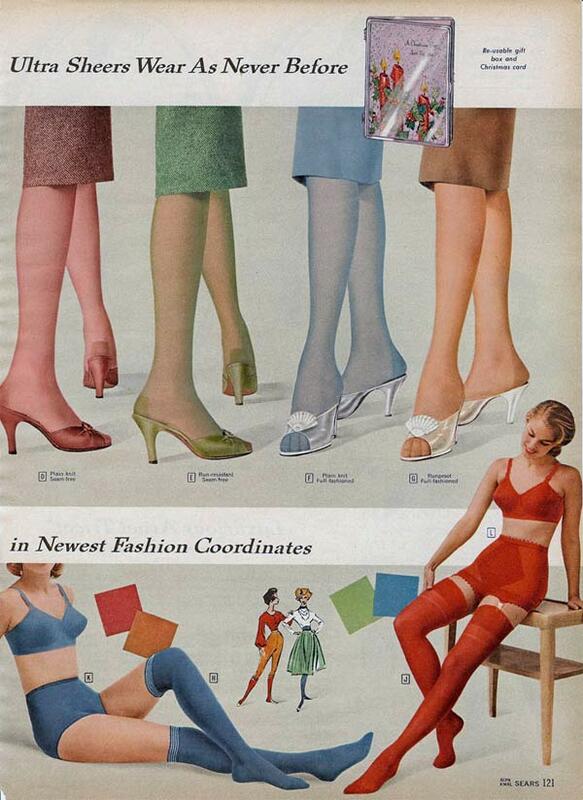 The quintessential swingin’ 1950s costume always consists of bobby socks and saddle shoes. 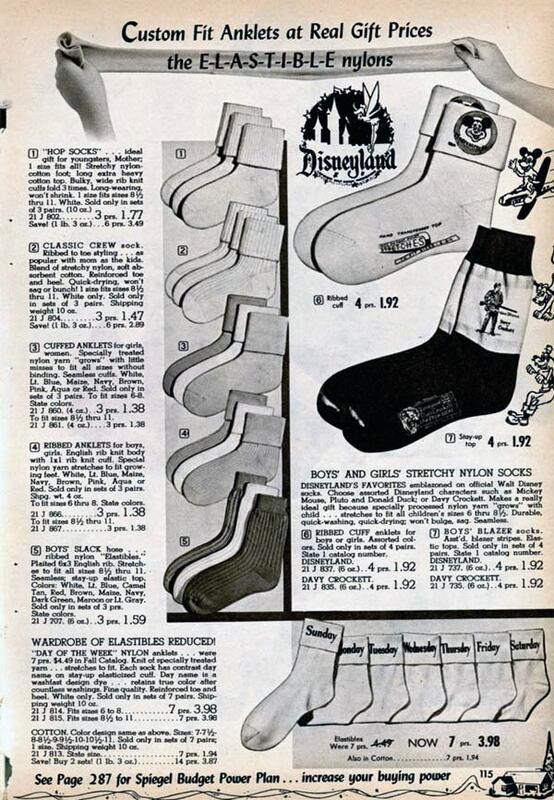 As usual, children in the 1950s could wear licensed socks like Roy Rogers or Mickey Mouse. 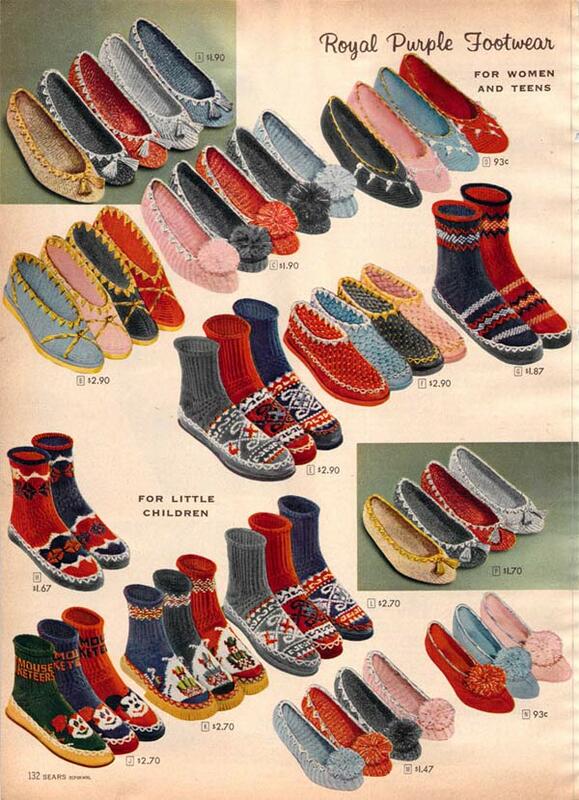 Looking for more info on 1950s socks & slippers? 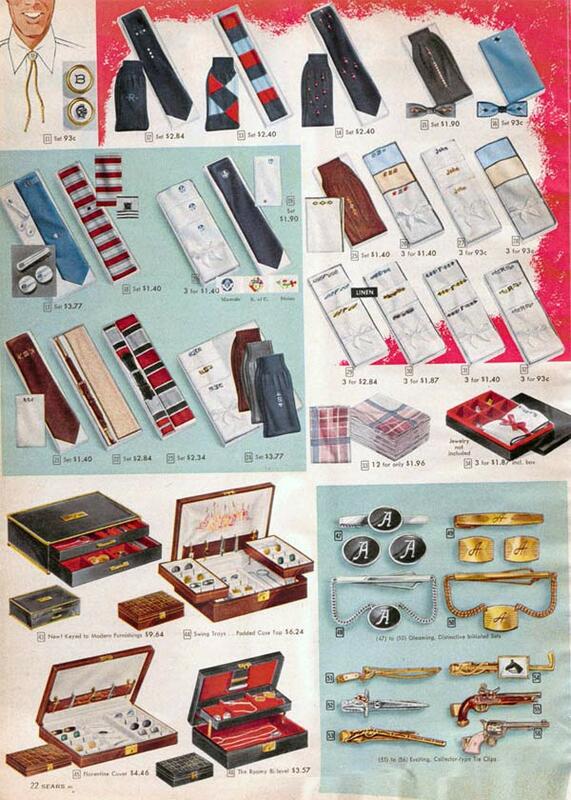 Check out the picture gallery below. 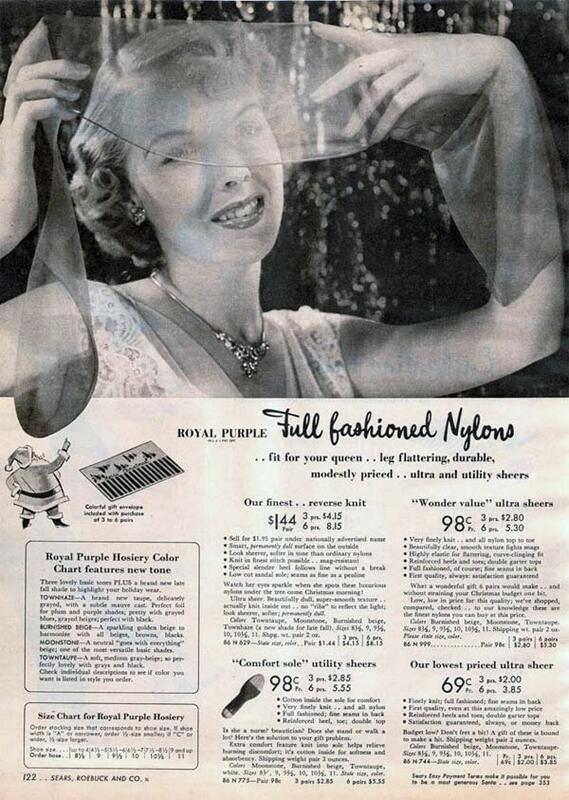 I remember peticoats, gowns and glass (vynil) with high heel shoes on my date. My Dad (now age 86) has a beautiful pair of moosehide, fringed indian moccasins that he says he’s had since before WWII. 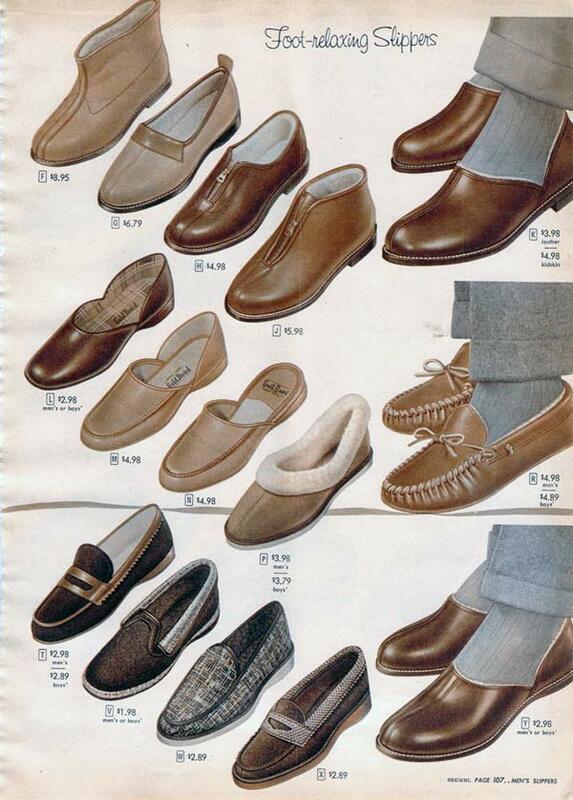 they are kind of like “huron” (puckered toe, soft sole) but they have a tiny one inch, thick fringe (almost like hair but it’s leather) around the pucker, the collar and the flaps of the moccasins. 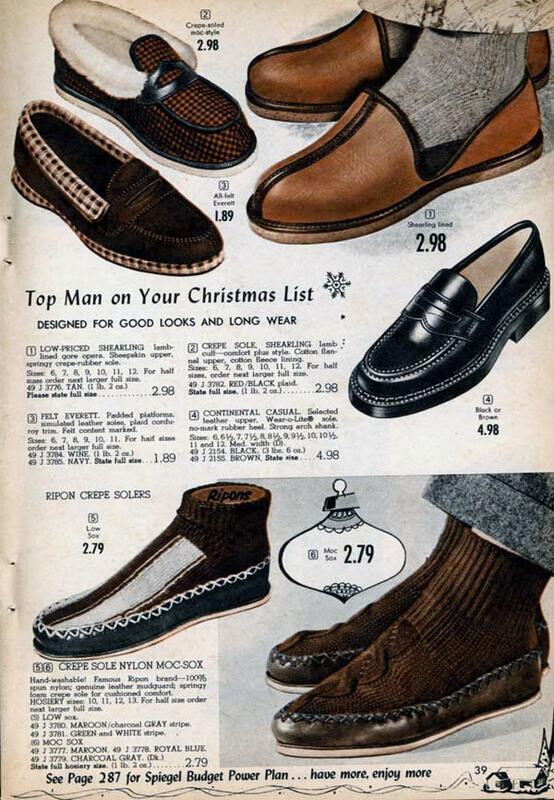 They still have the leather ties and are lined with real sheepskin. 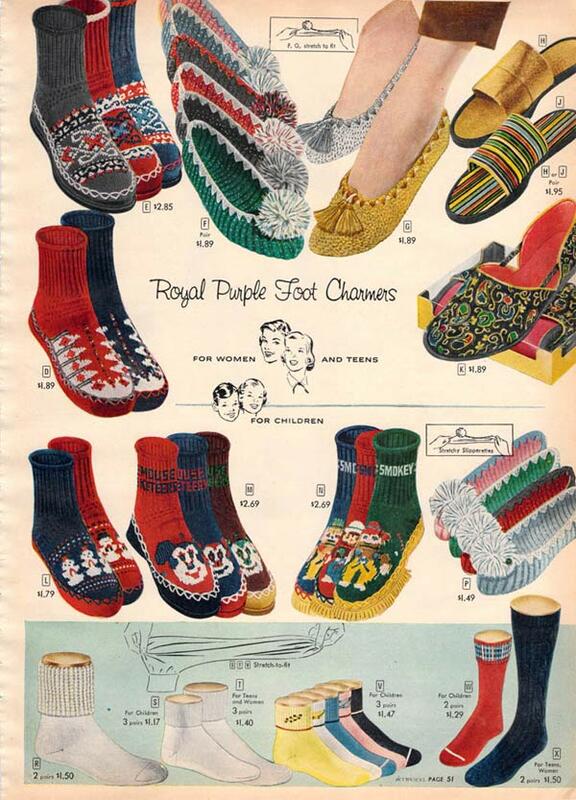 I used to wear them to play Indian when I was a little girl (even though they made my feet look like skis) and I’d love to find out more. 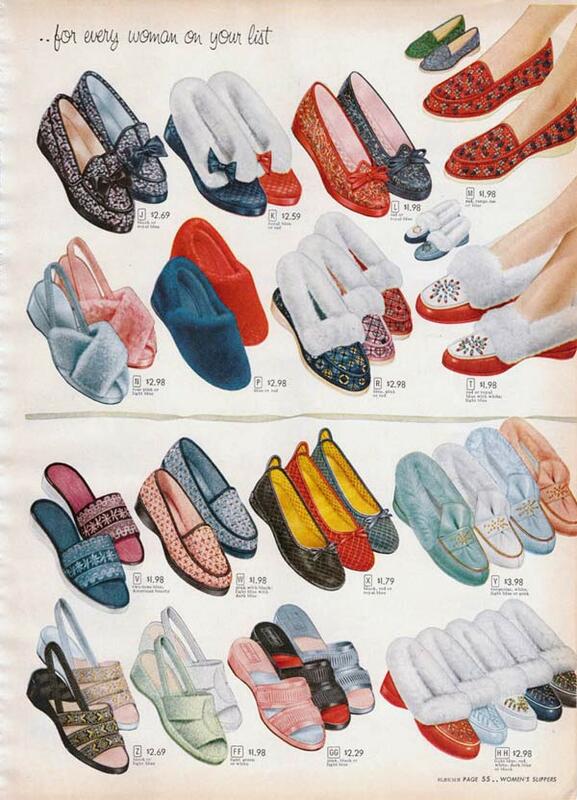 I remember thin, black velvet slippers (Chinese? ), with a partition between the big toe and the rest of the toes, that fastened with a metal hook on the side. 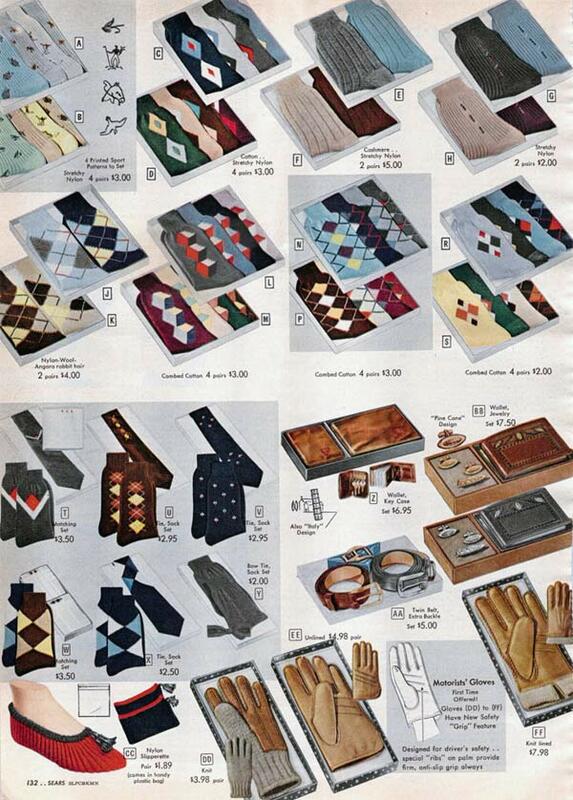 My mom & I both wore them (in the house only, not outside). 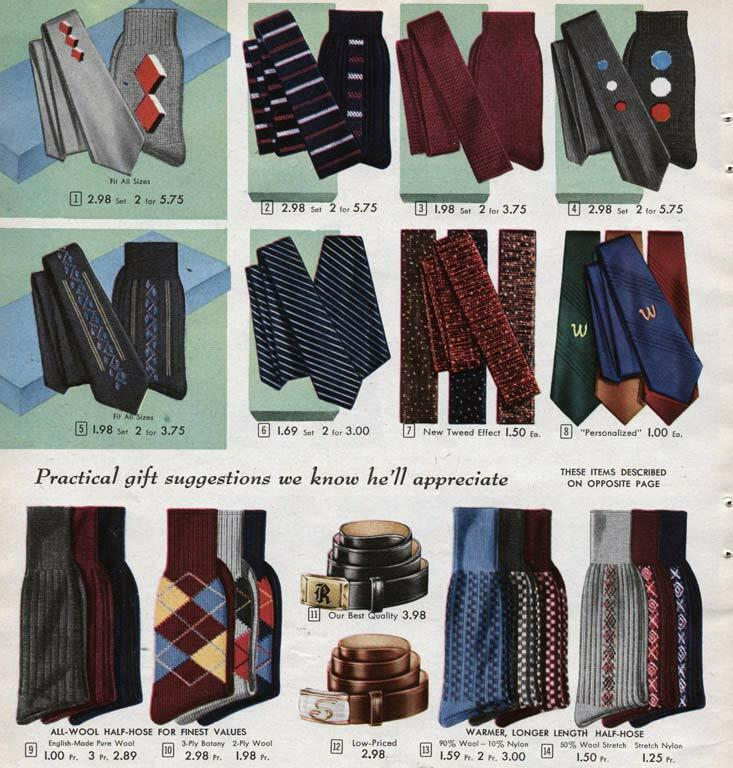 I was in grammar school in the early 1950s. We called them “tappies” (? spelling). Does anyone else know about these? 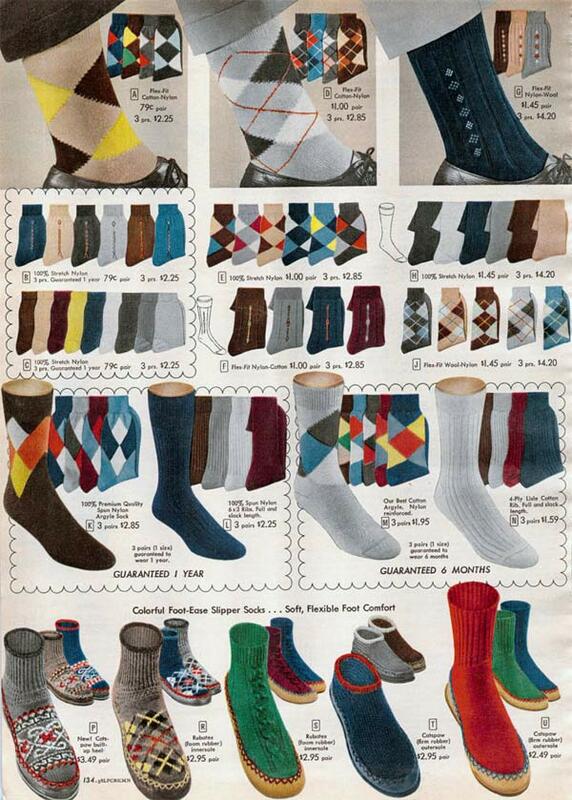 I cannot find them online.